Just as personal car ownership had a fundamental impact on mobility in the last century, new forms of transportation are spurring another revolution—one that comes with its own set of challenges and opportunities. Today, we’re at an inflection point, the private and public sectors need to come together and collaborate on ways to create smarter, safer and more efficient ways of getting people from A to B. As more people have come to rely on Uber, our technology has become an important part of the transportation fabric of cities. With that comes a responsibility: we recognize we need to step up and support cities that take bold steps to solve their transportation problems. We are in a unique position to have a meaningful and positive impact on the communities we serve across the globe—a responsibility we don’t take lightly. That’s why today we are making a series of announcements focused on urban sustainability and improving the cities we serve. I’m proud to share that we’ll commit $10 million over the next three years to campaign for ideas that put the long-term public interest over maintaining the mobility status quo, even when doing so is politically difficult. We’ll use The Shared Mobility Principles for Livable Cities, which were developed by the leading international NGOs in sustainable transportation, as our guiding principles in determining how to allocate this fund. Smart transportation policy should be targeted at the problem it’s aiming to solve. In the case of street management and congestion, data that helps cities understand how their streets are being used is an important first step to improve policy. Today, many cities lack detailed data on street speeds, a foundational data set for almost any transportation analysis. To help solve this issue, we’re donating $250,000 to SharedStreets, a nonprofit creating the standard for how organizations—public and private—can share data that can improve our public streets. But our commitment to better data runs much deeper than financial support. As a company facilitating more than 15 million trips per day around the globe, we have a unique opportunity to make the wealth of data we collect available for use by the cities we operate in. That’s why we’re partnering with SharedStreets to build state-of-the-art standards for how private players can share road speed data. This is something cities have been asking us for, and we’re thrilled to be able bring it to life in cities across the globe. You can read details about our work on road speed data and developing a new standard with cities on our blog. While it’s our biggest effort to date, this isn’t the first time we’ve made progress in this space. We’ve previously partnered with SharedStreets to better understand how our cities’ curbs are being used, with the goal of making curb space more efficient. Today, we’re excited to see other ridesharing companies join this initiative, which means more data to support policy decisions. The news will also support our existing work around Uber Movement, where data from Uber trips in more than two dozen cities around the world is available, for free, for public research and policy development. One of the key Shared Mobility Principles focuses on the efficient use of curb space. Many cities around the world are already making important strides in this direction by managing their curb parking for greater parking productivity, or opening new areas for shared ride pickup and dropoff. But we recognize there are only limited resources for cities looking to understand where and how new modes of travel could be accommodated using existing, limited curb space. Today, to help address that gap, we’re proud to share a study by Fehr & Peers that focuses on providing cities with actionable ways to create safer, more efficient streets and curbs. Anyone can access the full report for actionable suggestions on curb design, as well as our blog on the findings for more details. 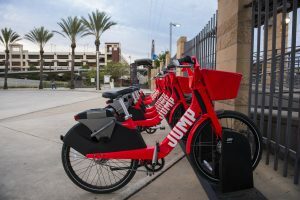 Our acquisition of JUMP was a direct investment in the idea that the best way to get around a city is sometimes not in a car at all. We’re proud to say the early results from having JUMP integrated into the Uber app are positive. Based on data in San Francisco, we found that on weekdays between 8 a.m. and 6 p.m. (when congestion is at its worst), trips by Jump riders on the overall Uber platform climbed 15%, even as their rideshare trips declined 10%. But getting to scale won’t be easy. For one thing, we need to ensure that cities have the infrastructure in place to support e-bikes. To make this a reality, today we’re launching first-of-its-kind charging stations for shared dockless bikes, where JUMP bikes can be placed in a charging station when there’s one available at the riders destination. We’re starting with a deep partnership in Sacramento, California, where we’ll offer charging stations across the city at convenient destinations, including public transit stations and universities. We’re partnering closely with public entities including the Sacramento Regional Transit District, Sacramento Council of Governments and California State University, Sacramento, to make e-bikes a viable option for everyday use, whether that’s commuting to your job or getting to and from public transportation. There’s still a lot of work to be done to transform many of the cities where we operate into safe and appealing places for bikes, with the necessary infrastructure and policies. With that in mind, the new sustainable mobility fund will also provide a donation to PeopleForBikes, a nonprofit that works with federal, state and local leaders to advance bike project funding and pro-bike laws around the US. Together, we believe uniting our efforts around a shared set of goals can create a better future for the cities we live and operate in. I’ve previously said that technology on its own is not a solution for urban problems, but that Uber is committed to doing more—and with the announcements we’re making today, we’re thrilled to be making steps toward delivering on that promise.